There is more than one way to save lives. The Mississippi Department of Rehabilitation Services (MDRS) has built a team and a coalition of businesses and organizations that work toward common goals — helping to rehabilitate individuals who are disabled from birth, disabled by injury, or have developed a disabling condition. At the same time, they are working to prevent injuries that are disabling. MDRS accomplishes these goals through empowerment, self reliance, jobs, and education. With the help of the MDRS, individuals challenged by disability are often able to achieve greater self reliance and even make joining the workforce a real option. This agency is able to use common-sense solutions to create more positive outcomes for all involved. Every year people in Mississippi are born with disabilities. Others have their lives changed by disabling injury. Our citizens face challenges of living with blindness, deafness, and other physical disabilities, as well as those that affect brain function, such as autism. Most outside observers do not see past the disability. However, the disability does not define the person, nor does it define all of their struggles or abilities. Life-changing disabilities affect more than just one’s body. Beyond the disability there is a want to feel productive and contribute — to have a meaningful life. It is human nature to want to live up to one’s potential. It is a matter of dignity and respect. There are many individuals who have the ability and drive to be a part of the working community, or can become able to take care of themselves, and can live in their own home without 24-hour assistance. However, they may need a little help, guidance, and support to get there. It is these individuals that the MDRS reaches out to and embraces with assistance, resources, and connections that enable them to participate in the workforce and live more independent lives. Traditionally, some who become significantly disabled are relocated to a nursing home. However, many of those individuals would much prefer to be able to take care of themselves at home, without assistance or with the assistance of a personal care attendant. Affording a person the dignity to manage as much of their own life as possible is not only ethically the right thing to do, it also only carries about one third the cost. Annual costs for an individual in a nursing home may run $80,000. Assistance provided by a personal care attendant may only cost $20,000-$25,000. People who can reside at home rather than in a nursing home see savings in Medicaid costs and an increased quality of life. The irony is that there is a waiting list of disabled individuals wanting to reside at home. In June 2015, there were around 1,500 people on the list. Since July 1, 2015, MDRS has helped place over 1,100 individuals back in their residences, has reduced referral time, and decreased the average size of the rotation in the waiting list to 400-600 individuals. This is getting more people into more independent living situations faster, which is a benefit to all parties involved. Whether the person is working from home or on a job location, MDRS is helping disabled individuals be able to work in Mississippi. For example, individuals working through the MDRS have gained valuable work experience packaging bullets for Winchester in Oxford, doing woodworking and construction of deer stands, pallets, and dog houses in Starkville, and building crab traps on the coast. It is individuals from the MDRS-influenced workforce who maintain the lawns and provide the janitorial services at the Armed Forces Retirement Home in Gulfport. The MDRS brings strategic partnerships and programs to bear in order to prepare an individual and maximize their potential. Both the programs and the partners work toward common goals with common measures, and all are on a mission to drive the workforce in Mississippi. Through the federal Workforce Innovation and Opportunities Act, MDRS is able to help facilitate a combined plan to help individuals achieve their best level of performance in a skilled job. The federal act is designed to help fund efforts at the state level to develop the workforce. It supports real-world educational and workforce development opportunities through On the Job (OTJ) training, incumbent worker, customized training, pay-for-performance contracts, and sector and pathway strategies. The act promotes creating smaller, more agile, strategic workforce development boards at the local level to implement the workforce development initiatives. Funding is also addressed in the WIOA. Ultimately, the MDRS is approximately 90% federally funded, with the balance coming from the state of Mississippi. The DHS is involved in providing assistance to families in need through Temporary Assistance for Needy Families (TANF) and the Supplemental Nutrition Assistance Program (SNAP). The DOE is involved in facilitating individuals benefiting from the Carl D. Perkins Career and Technical Education Act (CTEA), first authorized in 1984, and passed into law August 12, 2006. The intent of the act is to increase the quality of technical education in the United States. It provides local funding for programs of study that link academic and technical content in secondary and postsecondary education programs. The MDA assists in connecting industry and business with the workforce being developed through the efforts of MDRS, its partners, and specifically the individuals stepping up and wanting to participate in the workforce community. 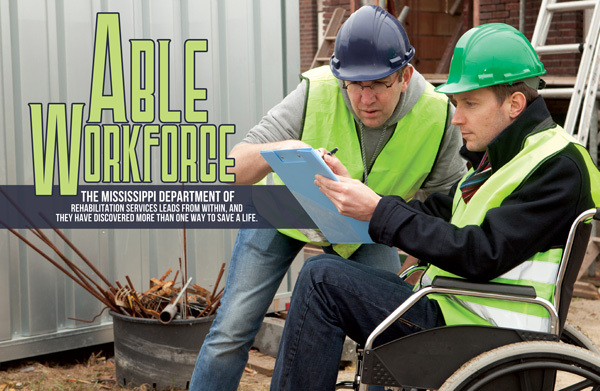 Last fiscal year, 24,261 Mississippians with disabilities were served by MDRS. That service equates to jobs, independence, decreased state expenses, and an unmeasurable amount of dignity and well being. The MDRS administers the Spinal Cord Trust Fund as part of a mission to raise awareness and ultimately prevent life-changing spinal injuries. These injuries do not just occur as a result of random car accidents. They also occur in activities that many Mississippians take part in regularly, and unfortunately, people are generally unaware of the real risks and sometimes severe consequences. Football concussions, texting and driving vehicular accidents, bicycle accidents, and horse-riding accidents all happen, and many can be avoided or reduced with equipment and common sense. The MDRS has broad-reaching responsibilities, but ultimately they are a state agency that helps Mississippi citizens with disabilities live more independently, while also acting as a kind of employment agency for those individuals who are able to work. Mississippi is a people state. It is known for taking care of its own, and demonstrates that regularly. Mississippi consistently ranks as one of the most charitable states, despite being one of the poorest. When Hurricane Katrina hit the coast, Mississippi picked itself up by its bootstraps and got to work, without waiting for outside assistance or handouts. Neighbors were helping neighbors. Neighboring cities were helping neighboring cities. In Mississippi, we help people help themselves. That is precisely what the Mississippi Department of Rehabilitation Services does, across communities and across government and private organizations. If you would like to learn more about participating in employer or employee opportunities here in Mississippi, call 800-443-1000, or visit the MDRS website at www.mdrs.ms.gov.